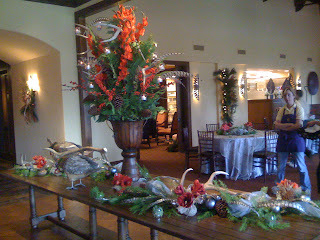 This was the buffet arrangement and table scape for the Advisory Board dinner at the Carlton Woods - Fazio. 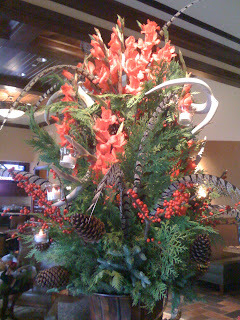 The main buffet arrangement included red gladioli, feathers, flat cedar, red berries, pine cones, mixed Christmas greens, votives, and antlers. 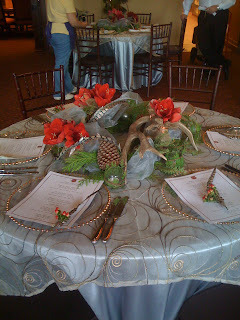 The table scape garlands included the same elements as the table centerpieces, with the exception of Elk antlers instead of Deer. 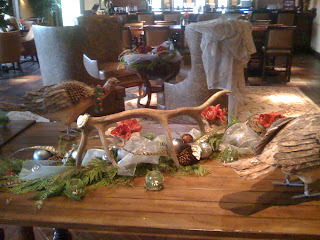 We also used the turkeys from the shop as woodsy accents. These were the centerpieces for the 6 tables. We used 4' of real Christmas garland to make wreaths, and then used a silver fabric, ornaments, feathers, pine cones, antlers, and amaryllis in burlap covered bud vases. There were also 6 glass votive holders that were covered in flat cedar and bark wire. We used the smallest of the silver feathers with a bit of red hypericum berry wrapped in bark wire as an accent for the napkins/ menus.